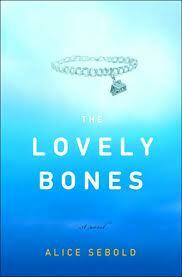 The Lovely Bones is a lovely book. Thoughtful, emotional and a beautiful depiction of life after a horrible death. Susie Salmon is murdered by George Harvey, the strange neighbour who likes to build dolls houses. Her death rips the family apart. But they are not alone. Susie continues to watch over them, following her family as they learn to cope with her death and unsolved murder. That's all I can tell you. You need to read the rest yourself. Alice Sebold is a gifted writer with the ability to paint raw emotions through place, sight and sound. You'll float away with a beautiful description of everyday life. And then she hits you, with a sucker punch of intense horror, power and the dark side of humanity. Before I finished the book, I overheard a heated debate in the kitchen at work. They were disagreeing on the strength of the ending. Needless to say, I left the room so as not to spoil the ending (which, by the way, made me cry. Again). This is a wonderful book. Read it and weep. Buy the book and watch the trailer (I haven't seen the film, so can't recommend it). I'm SO bad with "popular" books, so thought I was going to hate this - only read it because I was in a bookswap circle and hence "didn't have a choice" - and how glad I am I did, because I would have missed it, and I thought it was brilliant (aside from the heaven bits, which I found a touch on the cheesy side). Relieved it's not just me! !